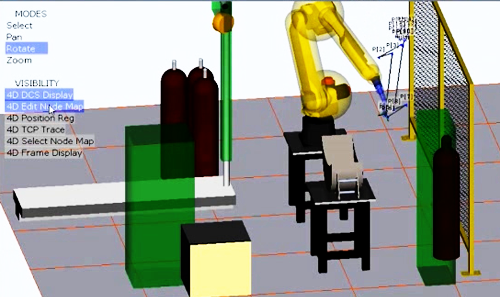 The 4 in the 4D represents the additional level of visual process information available, “Making the invisible – visible.” This means that on the screen the user receives 3D visualization of the robots movement. One of the upgrades to the newest R-30iB iPendant controller is the availability of 4D graphics (V8.10 and later). The 4 in the 4D represents the additional level of visual process information available. 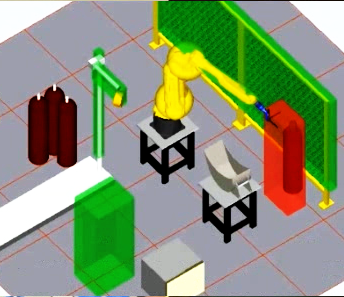 FANUC describes 4D graphics as, “Making the invisible – visible.” This means that on the screen the user receives 3D visualization of the robot’s movement. 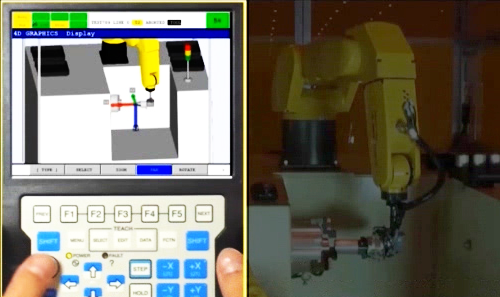 “The 4D Graphics option provides a user-friendly method of interacting with the robot,” explains FANUC America. The new iPendant screen is very user friendly allowing the user to pan through, zoom in/out, and rotate around the robot cell to analyze the robot’s movements. This is most easily accomplished when using an iPendant with a touchscreen. Allowing the user to be visually aware of all of this information and its interaction, greatly reduces problem solving time. This speeds up new training, robot recovery, and programming touch-ups – getting the robot cell back to work faster. This productivity option available through FANUC requires that the Dual Check Safety (DCS) software package is installed to show DCS information. If this is something you think you might want to add to your robot system to help improve problem solving techniques and time, there is a demo option available – contact Motion Controls Robotics to find out more.